New custom cabinetry makes a world of difference in how a room looks and functions. The creation of a home office, a dressing room, a new closet, or any other project involving custom cabinets requires a lot of decisions to be made about what will be included in the design of the cabinets. Choosing the right decorative hardware for cabinets that are part of your home improvement project is just one of those many decisions. The type of decorative hardware used with your custom cabinetry might seem like a minor detail in relation to the wider scope of what may be a big project. But you can be sure, every detail matters when you’re having something designed that you’ll be using and looking at every day. The decorative hardware for cabinets you choose will be right there, front and centre, on the finished product. The right choices of cabinet knobs, pulls, and hooks can add character to a room, in subtle or more pronounced ways. Poorly chosen decorative hardware, on the other hand, can have a similarly negative effect on the visual appeal of a room. Your decorative hardware choices also put a personalized stamp on your custom cabinetry. 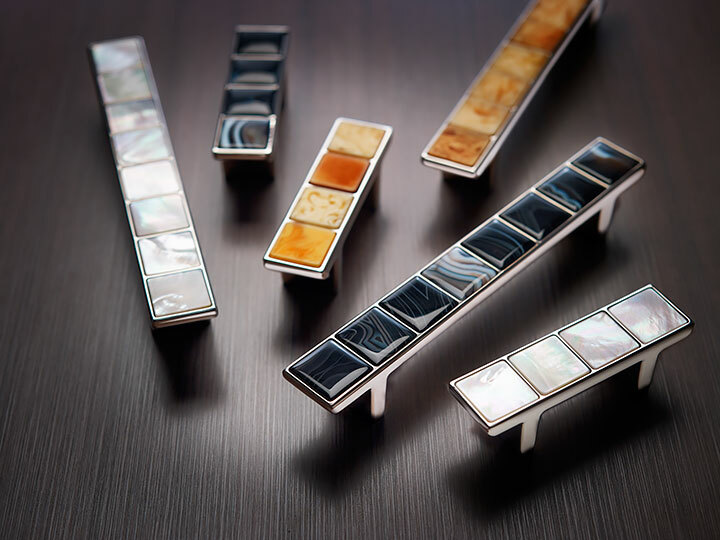 So exactly how do you make smart choices when it comes to decorative hardware for cabinets? Here are a few tips. Psychologist Barry Schwartz’s 2004 book The Paradox of Choice argues that having an abundance of choice is a bad thing. We think he couldn’t be more wrong, at least when it comes to having custom cabinets designed. The whole point of choosing custom cabinetry over a big box store’s limited selection of off-the-shelf furniture is that you get the ability to have it designed to your needs (and let’s not overlook its higher quality, either). 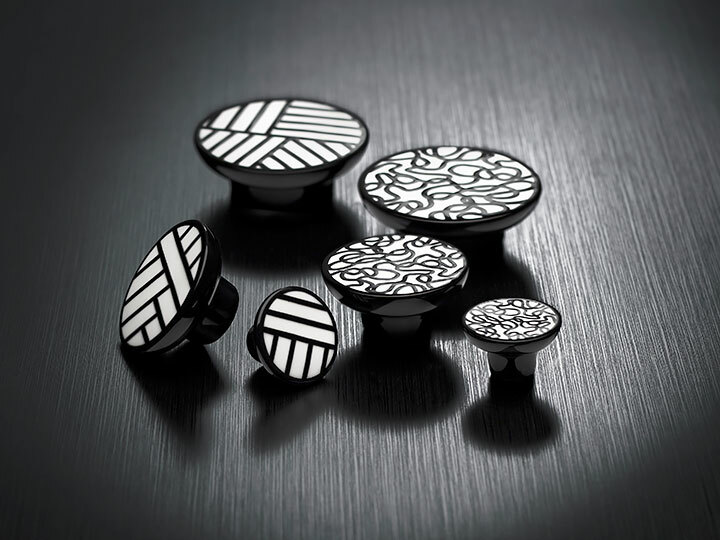 A key element of that customization includes choosing your decorative hardware. The more decorative hardware choices you’re presented with, the better chance you’ll have of finding the perfect hardware accessories to beautifully accentuate your custom cabinetry or closet space. An abundance of choice with custom-built products brings you that much closer to complete satisfaction with the finished product. Organized Interiors knows the benefits and importance of giving our customers plenty of decorative hardware for cabinets options. Our showroom has hundreds of samples of the industry’s best designer decorative hardware, including the largest selection of Richelieu decorative hardware in the GTA. Organized Interiors’ showroom has hundreds of samples of the industry’s best designer decorative hardware. In addition to complementing your bespoke cabinetry, having a wealth of decorative hardware options has other benefits. Cabinets that are designed to your specifications also make it easier to complement your home’s décor and its flow from room to room. Regardless of whether a room’s style is classic, contemporary, or transitional, there’s a decorative hardware style available to effectively complement and enhance any room’s look. Should you go with a trendier style of decorative hardware that might not be as pleasing to you several years from now? Does your room’s existing décor style make the choice more obvious? How about hardware sizes (meaning how prominent of a role do you want your knobs or pulls to play in the cabinets’ profile)? How much of your own signature do you want to put on your bespoke cabinetry? There are many questions to consider when making your decision about decorative hardware for cabinets, so be sure to leverage the expertise of a knowledgeable professional. A big part of your research when choosing decorative hardware should include getting a hands-on experience with it. The tactile experience of sampling potential pulls, knobs, and hooks you’ll be touching every day will give you a more personal connection to them. An up-close sampling of important factors like the hardware’s comfort and functionality will give you a better sense as to whether they’re the right choice for your custom cabinetry or closet. 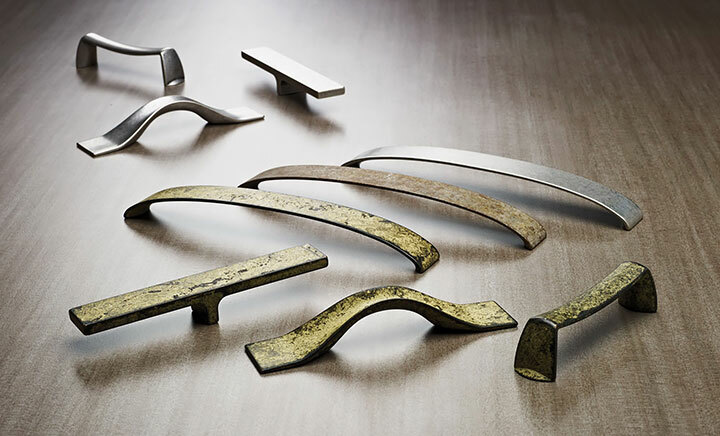 Does a weathered, rustic finish on a brass pull feel nicer to the touch than a smoother polished chrome finish? Maybe the feel of an antique glass knob compared to a metal knob with a satin nickel finish is more to your personal taste. Which size of pull or knob feels more comfortable? Actually touching the hardware will also give you an idea of what kind of quality your product has. Organized Interiors’ decorative hardware collection is manufactured to strict quality guidelines and features hardware created by world-renowned designers. We actually call it Artware. Why? Well, we felt the hardware was so beautiful that calling it “art” only seemed fitting! And there’s one more great reason to get an up-close view of the decorative hardware you’re considering – you’ll get a better idea of how it looks than you will from a picture on a computer screen or from a catalog book. Spending the time to make the best choices when it comes to important finishing touches like custom cabinetry decorative hardware is well worth it. 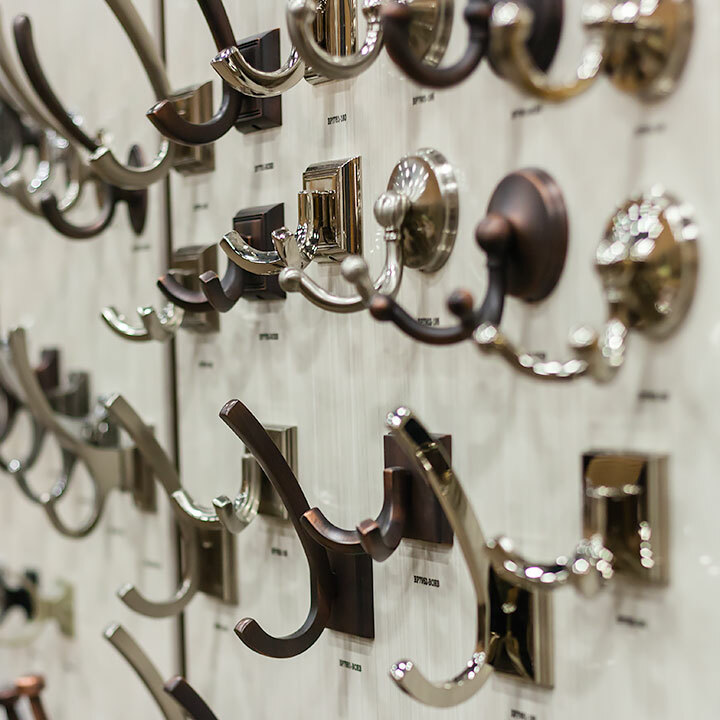 Organized Interiors has the best selection of decorative hardware for cabinets in the GTA, just waiting to be sampled in our 10,000 square foot showroom. If you’d prefer to have an Organized Interiors design consultant visit your home, book a free in-home consultation with us today. If you haven’t done anything to your closets since you moved into your home, they could be looking a little dated. Maybe you’re running out of storage space or dealing with a lot of clutter. It’s probably time for a closet upgrade. An organized home starts with an organized closet. Whether it’s in the bedroom, hallway or laundry room, you want your closet to be tidy, with belongings fitting perfectly into their designated spaces. This will make items easier to find when you’re in a rush, which is especially important in the morning as you get ready for work or help the kids prepare for school. So how do you upgrade your closet? If your closets aren’t as organized as you would like, don’t worry. These closet accessories can help you upgrade your closet to better match your needs. Tired of losing earrings and having necklaces become tangled? 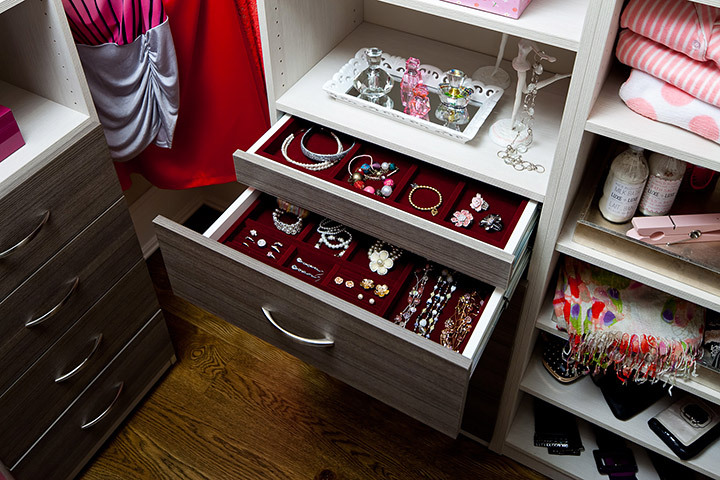 Add a jewellery drawer, one lined with felt, to keep valuable accessories protected and organized. Rather than piling shoes on top of each other on the closet floor, create a place for every pair with a pull out shoe shelf. Keep dirty laundry hidden by upgrading your closet with a laundry hamper. You can even add three hampers, which will allow you to sort colours right away and speed up the laundry process. Add drawer dividers to organize drawers housing smaller, miscellaneous items. You can also use drawer dividers to sort clothing items like socks, underwear and ties. Install a sliding belt rack in your closet to keep all of your belts or scarves in one place. Add another chrome hanging bar to create more space for shirts, dresses and suits. If you wish to upgrade your closet’s style, there are solutions for that as well. Small details like decorative hardware can make a big difference and can be used to enhance your interior design. A new closet door is another great way to upgrade both your closet and room. Here are a few options you might consider. For more smart closet upgrade ideas, come visit our showroom to sample our products and talk to our design consultants. Frivolous gifts can be fun to give, but they aren’t always what recipients want or need. This year, give a gift that friends and family will actually find useful. Practical gifts like decorative hardware are the perfect finishing touch to various home improvement projects and can be enjoyed for years. High-quality sunglasses are an investment in eye care, but they can also be a fashion and home accessory. With a custom sunglasses display case from Organized Interiors, one could use a stylish pair of sunglasses to enhance the appearance of his or her interior. To help a friend or family member design a beautiful display case, consider giving gorgeous Swarovski crystal knobs to complete the project and create a stunning look. Do you have friends trying to organize their walk-in closet or mudroom? Help them out by wrapping high-quality hooks designed in the finish of their choice. Organized Interiors offers a wide variety of styles and finishes to make organizing projects a breeze. The new year is often a time for change, and this includes changes in interior design. Contribute to a home office makeover or laundry room remodel with stylish handle pulls. Handle pulls might not be as flashy as jewellery, but they will certainly be appreciated by those undertaking larger home improvement projects. When it comes to interior design, details matter. Give the gift of decorative hardware this year to help loved ones taking on projects give their home a stunning new look. 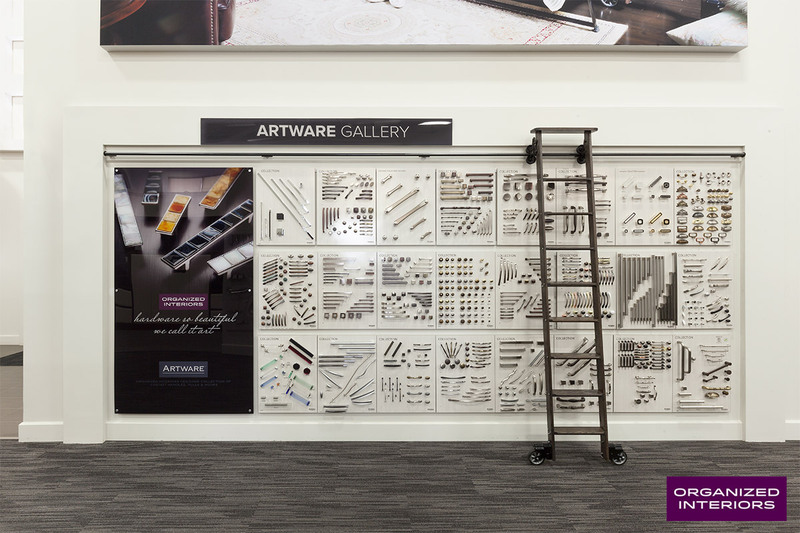 Visit the Organized Interiors showroom, where hundreds of decorative hardware samples are available for you to view.